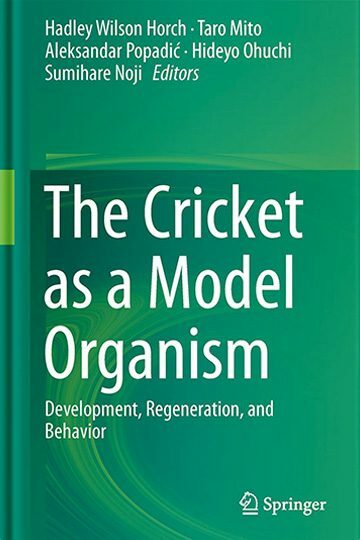 This book covers a broad range of topics about the cricket from its development, regeneration, physiology, nervous system, and behavior with remarkable recent updates by adapting the new, sophisticated molecular techniques including RNAi and other genome editing methods. It also provides detailed protocols on an array of topics and for basic experiments on the cricket. While the cricket has been one of the best models for neuroethological studies over the past 60 years, it has now become the most important system for studying basal hemimetabolous insects. The studies of Gryllus and related species of cricket will yield insight into evolutionary features that are not evident in other insect model systems, which mainly focus on holometabolous insects such as Drosophila, Tribolium, and Bombyx. Research on crickets and grasshoppers will be important for the development of pest-control strategies, given that some of the most notorious pests also belong to the order Orthoptera. At the same time, crickets possess an enormously high “food conversion efficiency”, making them a potentially important food source for an ever-expanding human population. This volume provides a comprehensive source of information as well as potential new applications in pest management and food production of the cricket. It will inspire scientists in various disciplines to use the cricket model system to investigate interesting and innovative questions.